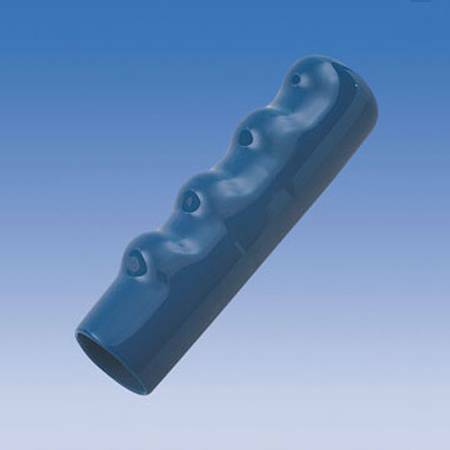 At Harman Corporation, we offer a wide variety of plastic grips, offering numerous shapes, sizes and colors for any application necessary. 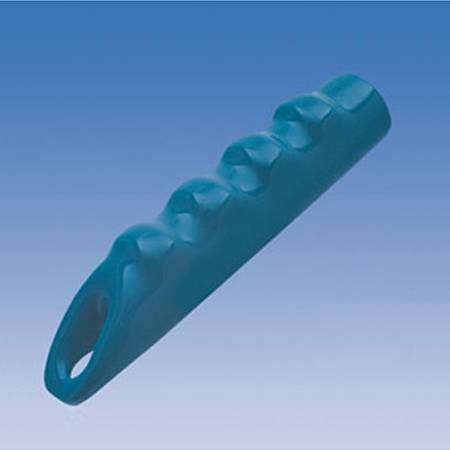 Add these plastic grips to any handheld product requiring repeated use and immediately relieve pressure and wear on your hands. Whether you're looking for Round Plastic Grips and Rectangular Plastic Grips or Matte FInish Plastic Grips and Foam Grips, our vast selection of grips are applied in every industry from toys and bikes to tools and patio furniture. Need something above and beyond? Harman can custom design plastic grips for your specific needs and even print your logo on them! Harman Corporation provides plastic caps in a variety of different shapes, sizes and colors. Add these plastic grips and caps to almost any item, to create a safer home or work environment. 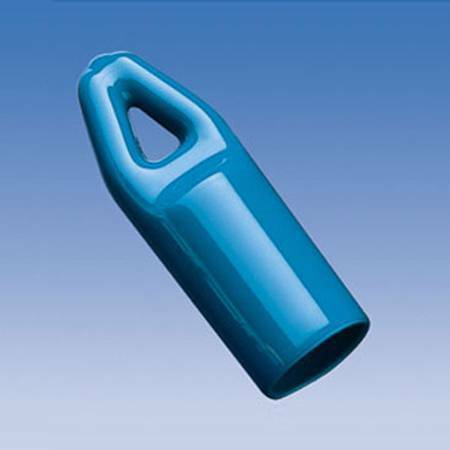 Each one of our lines of plastic caps has many uses in various industries, ranging from preventative measures for corners of glass tables and mirrors to use in numerous paint masking applications. One of our most popular plastic cap products is Plastic Round Hanger Caps, a line that’s perfect for the ends of brooms, dusters and mops. Need something custom? 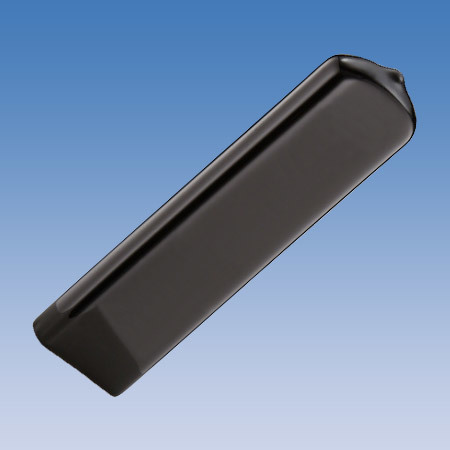 Harman Corp offers custom sizes on most products, along with the option to print logos on your plastic caps. We make Round Vinyl Caps to order! You specify your desired length and color. Lengths start at .187" up to the listed maximum length. Can be easily imprinted with your logo, company name or custom message. For caps longer than 2", please see our Vinyl Round Grips. Do your Round Vinyl Caps require a specific look or feel? Harman Corp offers various high quality finishes on many of our products, including Non Phthalate Flexible PVC, High Gloss, Soft Texture, Matte and Double Dip. If your product needs a specific finishing solution, call our knowledgeable sales staff at 248-651-4477 for availability. 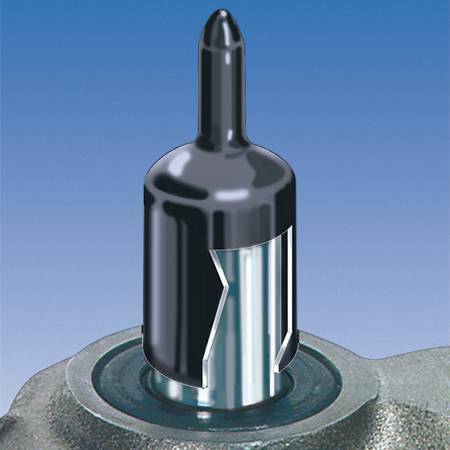 Description Round caps fit well on items that need to be protected from dust, moisture, and other debris such as the threads of machine parts. They can also be used to cover the harsh edge of toys or lawn or tools to create a protective, finished look. Round plastic caps are also regularly used as shipping caps in agricultural and farming applications. We make Finger Grabber Grips to order! You specify your desired length and color. Lengths start at 4.000" up to the listed maximum length. Can be easily imprinted with your logo, company name or custom message. Do your vinyl Finger Grabber Grips require a specific look or feel? Harman Corp offers various high quality finishes on many of our products, including Non Phthalate Flexible PVC, High Gloss, Soft Texture, Matte and Double Dip. If your product needs a specific finishing solution, call our knowledgeable sales staff at 248-651-4477 for availability. Description These finger grabber grips are specially designed to improve slip resistance with ergonomic finger grooves. Able to be used on many common items such as garden & farm equipment, toys, and hand tools. 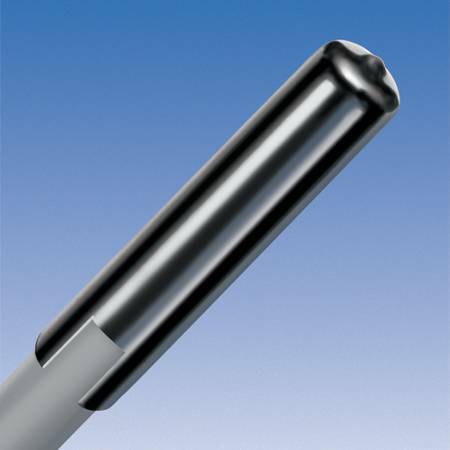 Harman Corporation will manufacture finger grabber grips to your specific needs. We make to order! You specify your desired length, material and color. Lengths start at 2.062" up to the listed maximum length. Our grips can be easily imprinted with your logo, company name or custom message. For grips shorter than 2", please see our Vinyl Round Caps. Description Round grips are common on many household items. They allow for extra comfort and add a finishing touch to the look of the item. The round grips can be used on tools, bikes, and many childrens toys. We make Round Vinyl Grab Tabs to order! You specify your desired length and color. Lengths start at .250" up to the listed maximum length. Can be easily imprinted with your logo, company name or custom message. New Tab Design provides more surface area to grab. Will your Round Vinyl Grab Tabs require a specific look or feel? Harman Corp offers various high quality finishes on many of our products, including Non Phthalate Flexible PVC, High Gloss, Soft Texture, Matte and Double Dip. If your product needs a specific finishing solution, call our knowledgeable sales staff at 248-651-4477 for availability. Description Round grab tabs provide more surface area to hold, which cuts back on the amount of pinching necessary to take the tab on and off, making it quick and easy to handle the tab. Round grab tabs work well as paint masks that are used to cover items during finishing operations, which include painting and powder coating. We make Hanger Grips to order! You specify your desired length and color. Lengths start at 4.000" up to the listed maximum length. Can be easily imprinted with your logo, company name or custom message. Do your vinyl Hanger Grips require a specific look or feel? Harman Corp offers various high quality finishes on many of our products, including Non Phthalate Flexible PVC, High Gloss, Soft Texture, Matte and Double Dip. If your product needs a specific finishing solution, call our knowledgeable sales staff at 248-651-4477 for availability. Description These hanger grips combine the features of the finger grabber grips with an opening at the end. This opening allows for items to be easily and conveniently hung in the garage or in the farm. Hanger grips fit tightly around the item, ensuring the item won't slide from the grip while hanging. Application: For Masking Studs, Threads, Hooks, Holes, Bolts etc. Description An air vent is added to the silicone flange caps, allowing pressure to escape when needed. 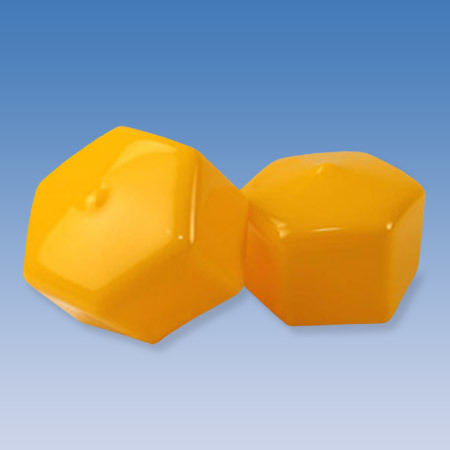 These silicone flange caps will also protect threaded studs during finishing operations. With a larger head and innovative internal gripping, silicone flange caps will not fall off, yet still makes application and removal easy. We make Round Vinyl Pull Tabs to order! You specify your desired length and color. Lengths start at .250" up to the listed maximum length. Can be easily imprinted with your logo, company name or custom message. Will your Round Vinyl Pull Tabs require a specific look or feel? Harman Corp offers various high quality finishes on many of our products, including Non Phthalate Flexible PVC, High Gloss, Soft Texture, Matte and Double Dip. If your product needs a specific finishing solution, call our knowledgeable sales staff at 248-651-4477 for availability. Description Specially made round pull tabs are used in applications where easy removal of the cap is needed. They work well as storage or shipping protectors, because they fit tightly without slipping, yet come off easily. Just as the round caps, rectangular caps, and square caps will protect industrial machinery (like farm equipment or hand tools), these round pull tabs provide the same shielding during use - only with a gripped handle for easy application. Description Often times, nuts and bolts are covered for a more desired, finished look. 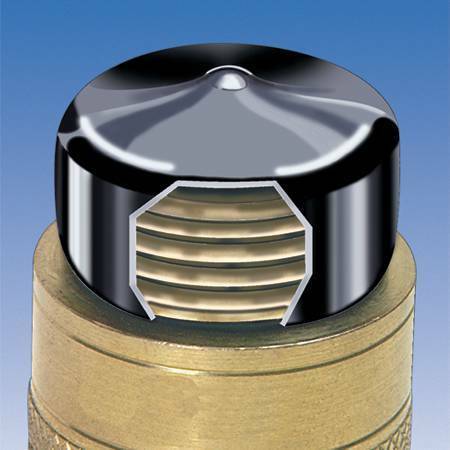 Hex caps will securely fasten to any size bolt, capping off the protrusion. Harman Corporation can custom make these hex caps, so specify the exact size you need and we’ll handle the rest! We make both flat-end (FE) and round-end (RE) rectangular caps and grips to order! You specify your desired length and color. Rectangular lengths start at .250" up to the listed maximum length. Caps and grips can be easily imprinted with your logo, company name or custom message. Harman Corp offers the industry’s most complete line of these hard-to-find grips. 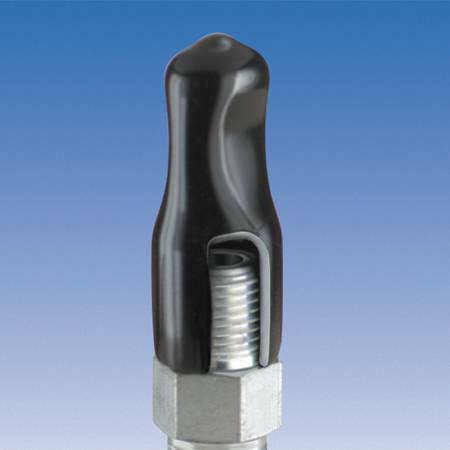 They are designed to fit rectangular bars that are commonly used on tools, valve handles, ball valves, and levers. The unique dip molding production process allows hundreds of variations with respect to wall thickness, hardness, inside length, surface texture, and color. Does your product require a specific look or feel? Harman Corp offers various high quality finishes on many of our bulk wholesale plastic products, including Non Phthalate Flexible PVC, High Gloss, Soft Texture, Matte and Double Dip. If your product needs a specific finishing solution, call our knowledgeable sales staff at 248-651-4477 for availability. Description Practical rectangular caps and grips are long and flat, making them great for use at home. Many items ranging from garden tools to kitchen knives may need caps or even a new grip. Similar to round caps, rectangular plastic caps and grips can be used as thread protectors. They are available in solid colors. However, Harman Corporation will print logos on these caps. Our vented Pull Tabs are popular in the medical industry. 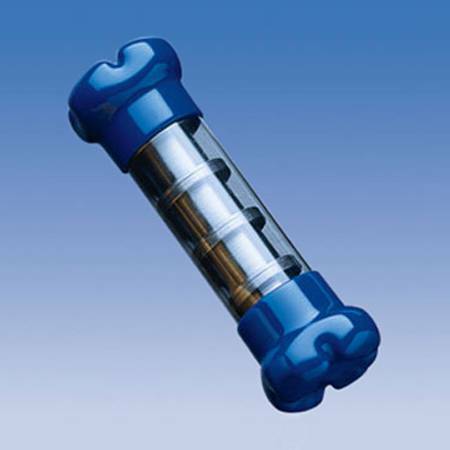 They feature a slotted design that will not deform or trangulate when applied to medical tubing. Air Vents found along the entire length of the cap allow air to escape during sterilization, thus preventing the cap from popping off. 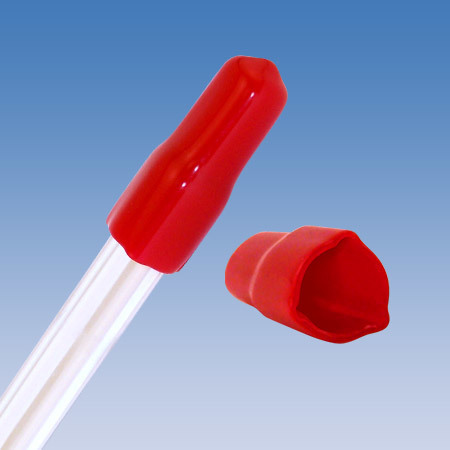 They provide excellent dust protection in medical applications where integrity of tubing is critical. Call Factory to order per your specifications. Description Slits that create small air vents throughout these vented pull tabs prevent them from popping off tubing or other items, as a result of pressure build up. This makes vented pull tabs very useful and popular among experts of the farming industry and numerous medical professions, as they help to protect mechanical tubing from harmful dust and debris. Description Anti-roll caps are square at the top instead of round. This prevents the tube package from rolling. These anti-roll caps are great to use when shipping items, where rolling may cause damage. 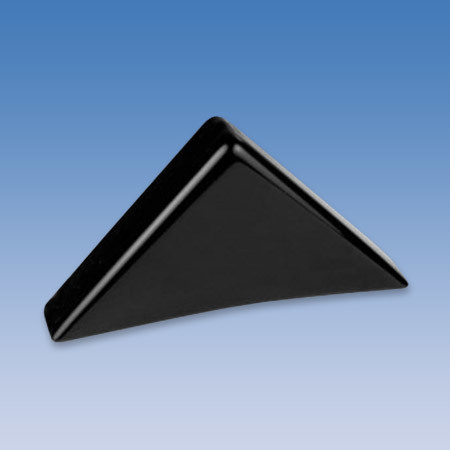 Protect glass and mirrors against chipping and breaking during shipment or storage with our vinyl dip molded corner covers. Corner covers are manufactured from tough, durable vinyl. 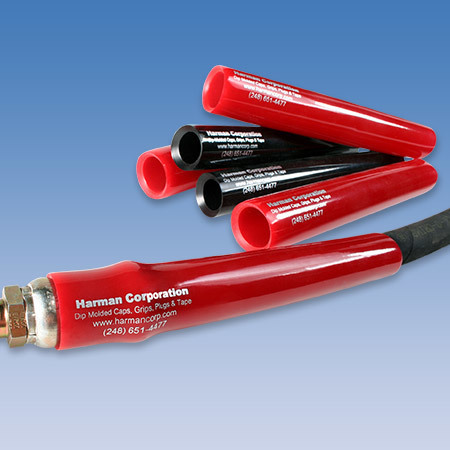 Harman Corporation can vary the length, wall thickness and color to meet your specific requirements. Description Corner covers protect your glass and mirrors from chipping or breaking during shipping and storage. Manufactured from strong vinyl, these corner covers provide ultimate protection and won't slip.